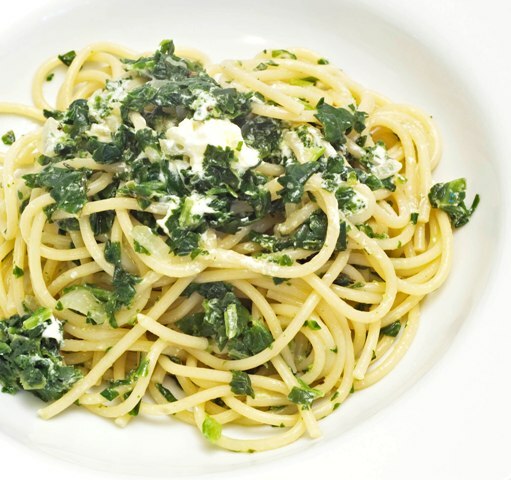 This recipe for Spaghetti with Spinach is probably one of the easiest recipes I have ever put together. Simply seasoned with onions, garlic, thyme and spinach, nothing to it. Just easy eating in a matter of minutes. Okay, not sure if this is a “great” fall back on a dish or a dud. I saw this whole “frozen” spinach write up in the latest Donna Hay magazine and thought to myself, “what a great thing to have on hand, frozen spinach”! I usually keep a bag of frozen sweet peas on hand for last minute risottos, stews or soups or the occasional bump or bruise, but spinach, never. Donna has this great recipe, well it looks great, with pasta and frozen spinach. I did not have the other ingredients so I just threw together something with what we had. Now, it was edible, it was not terrible, it tasted good but definitely was not the best thing I have tossed together. Lenny had this odd look on his face, the entire time I was cooking, it basically read “I cannot believe we have “frozen” spinach in the house”! Okay, let’s say it was temporary insanity; but, I want you to be the judge of this dish! While draining pasta, reserve about 1/8 – 1/4 cup of the cooking water. While pasta is cooking, heat olive oil in frying pan and saute onions until soft. Add a drizzle of white wine and the frozen spinach, cook until warmed through, about 10 minutes. Add garlic and thyme and cook for about 3 minutes. Toss with pasta and reserved cooking water just until moist not over saucy. 3 Responses to "Spaghetti with Spinach"
Instead of frozen, just throw in some fresh and it will wilt rather quickly. I can't do the frozen, I just don't like the taste. Looks nice though. When I was in college, I ate this dish almost everyday. I had about 40 minutes between my last class and my waitressing shift, and I would throw together spaghetti with frozen spinach, garlic, onions and some red pepper flakes. I used to defrost the spinach first by running it under warm water, and squeezing the excess moisture out of it. Ah, this brings back memories. I may have to make it this week for old times sake.